Ok so I decided its time to understand how this will actually work in practice. So I bought one futures contract for a 10 year futures note (/ZNM9) at a limit price of 122'230, which means the notional value is (122+23/32) * 1000 = 122,718.75. This futures contract expires in June, so I'll need to roll it towards the end of May into the next (September) contract. Currently the yield on the 10 year treasury note is 2.621%. I'll post again in here in May as a bit of a trade log to see how rolling this futures contract forward every quarter goes. Last edited by DonIce on Wed Mar 13, 2019 6:18 pm, edited 1 time in total. So I bought one futures contract for a 10 year futures note (/ZNM9) at a limit price of 122'230, which means the notional value is (122+22/32) * 1000 = 122,687.50. This futures contract expires in June, so I'll need to roll it towards the end of May into the next (September) contract. Currently the yield on the 10 year treasury note is 2.621%. What broker did you use, what and how much are you holding as collateral? I used my account at etrade. The collateral is my equity account there which has about $50k in index ETFs and a bit of cash. Interesting. I didn’t know they allowed equities as collateral. Let us know how the daily cash settlement works out for you. Will do. I probably know less than one ought to know before trading a futures contract but hopefully this education won't be too expensive. Small suggestion -- when you do roll in May, do it as a single roll trade (sell May buy Sep), since the bid-ask spread for such roll trades (which have low risk compared to outright trades) is probably smaller than for an outright trade. I know that Interactive Brokers allows you to place roll trades. Thanks. Yes, I see the roll option as well on etrade. Interesting to watch this futures contract as the fed meeting results were released a few minutes ago. It had way more of an impact on the portfolio than the equity holdings. Temptation to lock in a gain by selling on the news and abandon the long term strategy successfully resisted. How much is the bit of cash (= initial margin requirement)? FYI, in ThinkorSwim, it's $1,265 per contract (about 1% of $122,718). Let me be a little lazy and just ask exactly how this works at TD Ameritrade/ThinkofSwim if anyone knows. I used to trade futures in my IRA at Interactive Brokers. They require, or did then, you have to have enough *cash* to cover the margin requirement at every moment or they would liquidate your position in real time. It didn't matter if you had much more than the margin reqt amount in a low volatility bond fund ETF in the account, if the intraday mark to market on the futures brought your cash below the margin reqt. you might be kicked out of the position. I switched to TD/ToS when IB greatly raised initial/maintenance margin amount requirements in IRA's, which seemed to be about some scolding they got from regulators about something. Anyway, I've noticed TD does not impose the requirement in real time, and seems to take at least some account of what else you have in the account besides cash. In one big run down in the market last year I was long E-mini S&P futures (I do 'rebalancing' according to my own formula using futures) and actually went to negative cash. TD did not liquidate the position, even at the end of the day. It just showed a negative amount of cash available to trade, but v a much larger amount in the Vanguard short term corporate bond ETF VCSH I also had in the account. I sold shares in VCSH next day to restore cash to cover initial/maintenance margin plus a mark to market change of 2 std deviations over 5 days at the prevailing VIX, the habit I got into at IB for stock futures positions. But would TD allow you continue indefinitely at negative cash available to trade as long as you have enough value in other items in the account? If so what kind of 'haircuts' if any do they use to discount those ETF values? (for example if you had *stock* ETF's and were long *stock* futures it would not seem prudent of them to count the ETF value as if cash). I've just never gotten them on the phone to ask this, but sometimes if you ask slightly arcane questions to brokers the person on the phone gives you the wrong answer anyway. 1. Correct. In case of margin call (due to futures margin balance dropping below certain threshold), one needs to have enough "cash" (not collateral) to meet initial margin requirement. Otherwise, his futures position will get liquidated. For more, google "margin call" "initial margin requirement" "maintenance margin requirement". 2. Again correct. There's a waiting period between margin call and liquidation. IOW, liquidation doesn't occur immediately, even if you don't have cash in your account. IIRC, one has about 48 hours to avoid liquidation. He can sell other assets or deposit more cash into his account. Broker will not randomly sell other assets without the client's acknowledgment. 3. In practice, all these (margin requirements, waiting period) are set by the broker. The regulator or CME only sets the minimum. So the actual requirements vary by the brokers. Let me be a little lazy and just ask exactly how this works at TD Ameritrade/ThinkofSwim if anyone knows. But my question was TD's particular policy. Again IB will kick you out of a futures position if your cash drops below maintenance margin, in real time*, and it makes no difference what else is in the account. TD I know does not in real time, or even immediately at close, since I was below (negative cash actually) from late one day till I sold shares in an ETF just after next day's open. What I don't know is their exact policy, and whether it's affected at all by what else is in your account, that they know *you* can sell, not that they'd sell it. *or whatever delay to literal real time they might actually use, which they don't tell you and probably wouldn't if you asked. For example I don't know if IB liquidated every equity index futures position that briefly went below maintenance margin in the 'flash crash' a few years ago, but they really will in general liquidate your futures position if you go below maintenance margin based on *intraday* mark to market. Sorry, I don't know the exact policy of TDA in detail. I googled it but can't find specifics. FWIW, even if my futures position is liquidated after margin call, I'm not concerned. Liquidation doesn't mean losing everything. I'll get the remaining futures balance (which is less than what I started with) in cash and realize a loss. If I want the same previous position, I can re-create the same position (with added cash). It was less than the initial margin requirement of $1265 of the futures contract and stayed less for about a week with no problem. Playing around with what contracts it looks like it would let me open, it seems like it would happily use 50% of the full value of my equities as collateral, with no cash. However, it would charge margin interest on the resulting negative cash balance. But my question was TD's particular policy. FWIW, even if my futures position is liquidated after margin call, I'm not concerned.. It's not generally a huge deal in any case where they at least wait until the daily close. Under IB's practice of doing it intraday it could be a real problem, if they were to really do it instantaneously in a flash crash. You find out you were kicked out of a long position with the S&P down 100 ticks, but by the time you look it's almost back to unchanged on the day. That policy is safer for IB's financial stability, and so in fairness also for their clients as a whole, but could really bite particular people, potentially. With brokers like TD who ride out client margin deficiencies till at least the close (as everybody did years ago), it's a bit more risk for them and thus their clients as a whole indirectly, but eliminates that potential landmine of using futures. I only ask their very specific policy in case it might lead me to slightly optimize by holding less cash (and deploying a bit more to the short term bond ETF) than is my habit, acquired from trading with IB. To a certain extent it does not mattet what TDs policy is. TD can change their policy any time with zero notice. I used to work on a margin desk during the dot.com boom and bust. The first rule is to protect the firm - which both the Fed and SEC backs. During times of stress we thew out the policy book, and sold out clients left and right. Great thread filled with awesome info. I feel like we are making great strides in a variety of threads at better under standing leverage, risk parity and leveraged risk parity portfolios as a whole. Me, personally, im barely able to wrap my head around it but it seems like some others have really done a great job at making it more clear and understandable for the layman. These threads are rather exciting and I learn so much from them so thank you! Can someone please clarify why ZN or ZN or ZB for instance? IF we leverage up does it make more sense it stay close in curve as opposed to when we aren't levered we want to stay further out? Sorry if that doesnt make sense and bogs down the convo. To me the best way to go is not entirely clear. I think earlier in the thread someone linked an article showing that the sharpe ratios of shorter duration treasury futures were better. On the other hand, when you use futures, you get the return of the underlying minus the short term financing rate. So if you use short term treasury futures you basically just get the price return only (due to variations in interest rates) but if you hold longer term treasury futures you're gonna get a bit of the return that accounts for the higher interest paid by long duration notes vs short duration bills (not that that's much right now, yield curve is basically flat). Yet another person discussed the benefits of using strips of eurodollars. I went with ZN because it is the most liquid of the treasury futures and I find holding that easier to wrap my head around than strips. Whichever one you pick you want the dollar volatility of your equity portion of your portfolio to roughly match the dollar volatility of the treasury futures in your portfolio. So if you picked shorter duration you'd probably need to hold more contracts, which would also incur higher trading fees. I know this was briefly discussed but why would it not make sense to buy SPX and hold bonds instead of buying bond futures and unlevered equities. Realistically would it even make a difference? I know taxes were touched on earlier but I admit im am rather ignorant to how futures are taxed. 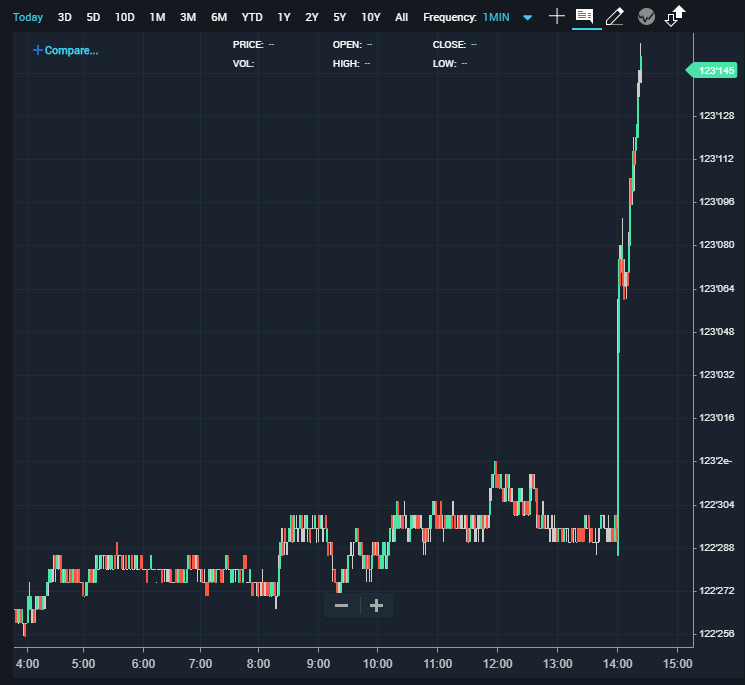 Look at e-mini futures S&P 500 futures contracts. The key insight is that you can exactly replicate S&P500 mutual fund returns by pairing cash with an emini futures contract. You can get your equity exposure through futures and buy low volatility assets with the remaining cash. This is a primary way that institutions get cheap external leverage. Gains and losses from futures trading are treated as 60% long-term capital gains or losses and 40% short-term gains or losses, as discussed here, which is more favorable than the treatment of interest income, especially if you have capital losses to offset the capital gains. That is one reason there is more interest in leveraging bonds than stocks via the futures markets. Futures are taxed as 40% short term cap gains and 60% long term cap gains. That's better than how bonds are taxed (ordinary income). So there is some advantage to having your bond holdings be futures rather than actual bonds in terms of tax efficiency. 1) Only S&P500 futures are liquid and easily traded as far as I can tell. That means no diversification into small caps, international, etc. Depending on your perspective, this may or may not be a big deal. Personally given the high valuations of US markets presently I would rather have a decent chunk of exposure to non-US equity. 2) If you want to have a high equity allocation (say 80-100%), you can lever up the bonds to achieve risk parity (200-300%) with futures easily. On the other hand, if you hold your bonds unlevered even upto the entire value of your portfolio (100%), then you'd only want 30-50% equities to achieve risk parity. 30/100 is a much lower return portfolio than 100/300 (obviously the 100/300 is riskier, as well). 3) Holding equities is more tax efficient than holding bonds, so you lose the benefit of the improved tax efficiency of futures for the bond portion. Anyone considering the use of futures to make a leveraged bet on bonds should ask if there is still a term premium. In a recent thread I pointed to research saying the term premium is currently negative. If that is true it's probably because bond investors are willing to accept slightly negative excess returns because they think stock and bond returns are negatively correlated. But in that case you should not own bonds, either directly or through futures, in excess of the amount needed to insure your stock positions, since they are insurance, not a source of stand-alone excess return. 1) Only S&P500 futures are liquid and easily traded as far as I can tell. That means no diversification into small caps, international, etc. This is incorrect. There are active and liquid futures on the Russell 2000 and Nasdaq 100 and on many foreign stock indices, such as the Eurostoxx 50, FTSE 100, DAX, and Nikkei. They can be traded through Interactive Brokers and other futures brokers. Furthermore, accessing these market via futures markets reduces currency risk, since your exposure is to index changes in local terms. Could you elaborate at all on what you mean? Lets say interest rates (and future expectations of interest rates) remain entirely unchanged relative to today. Shouldn't holding 10 year treasury futures generate a return equivalent to the difference between the 10 year treasury yield and the short term rate (about 0.1% today)? Ah, I see. I don't see as many international options on etrade. I do see Nikkei, but no European ones and no EM. found this interesting write up on what he was speaking off. It might help you. Where do you get the short term rate? The over night Fed rate is 2.5%. I can’t imagine the short term rate is less than the Fed rate. Is it? It must be a little over. 10 year treasury futures seems to be around 2.55%. The cheapest to deliver is less than 10 years. So why leverage 10 year ultras if you are only earning .21%? Even 10x leverage on 10 year ultra futures would yield less than holding 2 year treasuries directly. Ok you can leverage more but it seems like a lot of duration risk. Is my math wrong here? What is the actual short term rate you have to pay? As of today, the yield curve inverted so you would be getting paid negative to hold 10 year futures. On the other hand, the notional value of this futures contract has gone up quite a bit as yields have fallen, counterbalancing the fall in the value of equities in my portfolio today. Thanks for a great information. This explains why brokerages don't publicly announce margin requirement policies. I always wondered why. I agree with those mechanics points. For a broad side of barn estimate you can assume the implied financing rate on T-note futures is the T-bill rate, or calculate what it actually is by determining the actual issue which is Cheapest To Deliver for a given contract and comparing its cash price to the implied future price via the futures contract price and Conversion Factor. Just to add on that as I saw was mentioned in a another post, the CTD of the 'traditional' 10 yr note contract is usually around a 7-8 yr issue, there's also the newer contract designed to make CTD an issue closer to the on-the-run 10yr. Anyway as of yesterday the spread is zeroish to negative. However the philosophical question would be why you'd eschew any long position in T-note futures contracts at negative carry if you wouldn't sell all your cash treasuries whenever they yielded less than VUSXX or simply holding T-bills. That's also just about true now, depending which treasury maturity. And maybe some people operate that way. But I guess many don't. Negative carry is not fun but it doesn't automatically and categorically invalidate a position. For anyone interested in a futurers based portfolio, the CME is introducing Micro E-mini contracts for the S&P, Dow, Nasdaq and Russell. I think the contracts launch in May and will be 1/10th the size of the normal E-mini futures contracts. So each Dow point will be $0.50 vs $5 for the YM, and the Micro S&P will be $5/point vs $50 for the ES, etc. This would make rounding portfolios a little easier, as well as if someone wanted to include Nasdaq or the Russell rather than only the S&P, etc. You probably also want to time it right when the market has good liquidity for the roll trade. https://www.cmegroup.com/trading/intere ... oftheroll/ is a great tool for timing it, though it likely doesn't matter all too much for a single contract. - Is 2 5 year treasury futures contracts essentially identical to 1 10 year treasury futures contract? Can this portfolio be implemented at 1/2 the size then, using 2 micro S&P500 futures and 1 5 year contract? - Any suggestions for better backtesting to go back further? Some of the substitute mutual funds I picked are not great substitutes. Any way to figure out what are the oldest funds representing particular asset classes? - Which assets should be held in a Roth vs in taxable assuming about 50% of space available is Roth and 50% taxable? I'm thinking the futures and their collateral ought to be in the Roth for tax treatment, but the downside is that then within the Roth account the leverage is very high, and you can't add arbitrary funds to a Roth to avoid margin calls. Also splitting up one futures position to live in the Roth and the other in taxable gives up the uncorrelation benefit of these 2 assets (on an account by account perspective) so again opens up the possibility for significant enough losses to cause a margin call if just 1 of the 2 assets drops. Is this strategy essentially not implementable when half of one's assets are in a taxable account and half in a Roth? Am I correct in thinking that essentially the whole strategy has to be implemented within 1 account to avoid much higher risk of margin call than the overall strategy by itself would entail? - Any other thoughts on a strategy like this or comments on its implementation? Not quite. The "10-year" is the name of the futures contract because the maximum time to maturity to deliver into it is ten years, not because it's actually equivalent to an on-the-run 10-year treasury bond. The current hedge ratio between the 5 and 10 year contracts is 1.644, not 2. Interactive Brokers requires four times as much margin to be posted in retirement accounts, precisely to account for the high leverage and inability to dump arbitrary amounts of money into the account to meet obligations. Oh also, S&P 500 futures and treasury futures get cross-margined as well, since they assume like you that losses in one of the contracts will tend to sometimes have compensatory gains in the other. You should take into account the expected returns and cross-correlations, not just volatilities. As such, you're likely over-weighting gold (expected returns on holding commodities is roughly zero), and doing something weird with having both long-term and intermediate term treasuries (all you really care about, roughly speaking, is duration risk - you probably want to pick the "best" part of the yield curve and then lever up until you're taking enough risk). Thanks, I'll check these ratios between the different duration futures to get more exact position sizing. Are there any brokers that will "cross-margin" between an IRA account and a taxable account, considering the entire portfolio across the two accounts? Or is it always account-by-account? I guess that's the heart of the question I was asking. I was inspired by a post you made in another thread where you started to implement this strategy. Ive been toying with the Idea of risk parity for a while and I decided to put it into action. This is has been a good learning process and education in futures for me lol. My portfolio looks somewhat like yours but also a little different. Its not quite(Balanced) but if you run it through portfolio visualizer its not bad. Obviously pretty weighted towards equities and the US market. "1. Pick the Treasury maturity that has the highest risk premium per unit of duration. This is actually pretty easy. If you look at the yield curve graph, it's usually the steepest upward sloping part of the curve that is higher than the cash rate. This is often the 2- or 5-year Treasury note, but right now it's the 30-year due to the inverted yield curve." No. I used to work on the margin desk 20 years ago, but I don't think the rules have changed. Margin and leverage is highly restricted in IRA. There was no way to encumber or do anything like that with a tax advantaged account. Doing so would allow the broker to make distributions from that IRA account at any point from that IRA. Your IRA account could go negative, requiring you to make additional contributions - which you may not be able to do. etc. Inverse and leverage ETFs are also barred. What you can't get in the front door you can't get in the back door. Cool! Glad to provide some inspiration! It does look quite a bit overbalanced towards US equity which probably throws off the risk parity quite a bit. I'm also still skeptical of the daily leveraged ETFs. I haven't fully implemented mine yet. So far, I just have ~100% equity (about 80/20 US/foreign right now, but putting new money into foreign aiming for about 60/40) and the /ZN contracts. 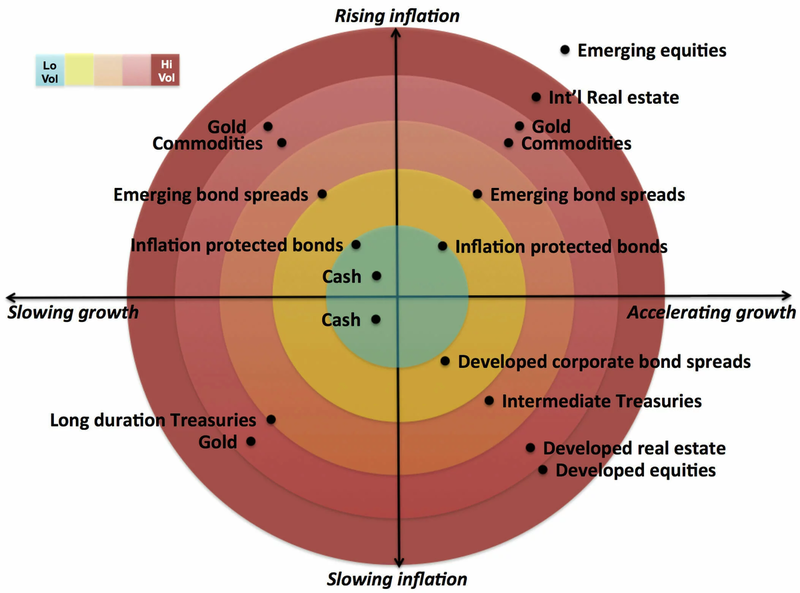 I'm hesitant to pull the trigger on gold just cause I'm still not thrilled with it as an asset, but I don't see much else that's a good substitute for it based on the above chart for the quadrant of rising inflation + slowing growth. I do not agree with some posters claiming IRA is highly restricted for leverage instruments. There are self directed IRA where in one can trade any instrument they are comfortable with. They even link it to broker who requires only CME margins, not inflated margin requirements like IB. Fees are higher ofcourse. I am replacing my US Large allocation with this to achieve better risk parity. +1. I have not bought any yet but I am looking to open a position soon. I like the idea of this fund to use leverage on the bond side to achieve near 100% of SP500 with less volatility. This ETF seems like a good instrument to achieve OPs result. I have wondered why it is necessary to own stocks and bonds when you could just own a contract to return the market price. Use leverage to get the risk level that you want. Is there some reason why I need to actually own the securities I am betting on? Some brokers have disallowed trading leveraged ETFs in an IRA, but I don't think there is a federal law banning them, and some brokers for active traders, such as Interactive Brokers, may allow you to buy leveraged ETFs in an IRA. This thread is more relevant than HEDGEFUNDIE's because user Rob Bertram uses treasury futures whereas HEDGEFUNDIE uses leveraged ETFs. A lot of good info in here. Should I use margin to buy a balanced fund? If you want to maintain a continuous roll on your futures and not try to time the market, I recommend that you look at how the futures are implemented in this thread. Having a lot of low duration contracts and either a long-term bond ETF like EDV or long term futures at a lower concentration creates a barbell effect which could potentially smooth returns. It's better explained in this other thread. I think I like TIPS for this part of the portfolio - the CPI adjustments are great for avoiding inflation risk, and they've got a liquidity premium on top of nominal treasuries as well. Long-term bonds are volatile enough in general that you don't particularly need the leverage of the futures market on top of that. Especially if you're already getting equity exposure through S&P 500 futures, freeing up a lot of your cash. Yeah that's kind of what I'm trying to go for in the portfolio I mentioned above. 10 year treasury futures contracts (duration ~7 years I think) and long term held as a fund (ZROZ is the longest term ETF I can find, a little longer than EDV). Thinking maybe its worth taking the contract down to the 5 year one instead of the 10 year though. ZROZ is longer term, but has more negative alpha. I would still pick EDV even if I was targeting a longer duration. If you have the space available, I would consider 2 year contracts as well. Can you explain what you mean? I don't see any difference in performance that would suggest a more negative alpha? You're looking at the wrong thing, but I was mistaken about the negative alpha. Both ETFs have positive alpha and which is higher depends on how you measure it. Looking at trading costs from the etf.com website, both normally trade at a premium, but the premium looks a little higher with EDV and the spreads look wider with EDV as well. So, ZROZ may be your best option.